Does today’s postcard represent a local scene? This stone bridge with its two wide arches resembles those of medieval origin, traversing any of a number of small European streams. Our local rivers are much too wide for such a bridge – and there’s not much room for a boat to travel beneath it. 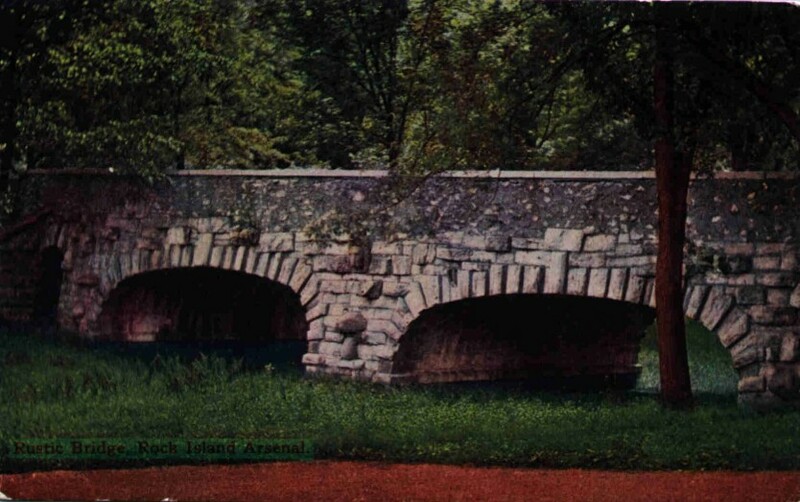 The circa 1910 postcard calls the bridge “rustic,” which often implies a rural location. But in that era, the term was applied to any particularly picturesque structure, even one in the midst of a city. Rustic can also mean crude and rough, but this beautifully engineered bridge with carefully shaped limestone blocks is anything but that. Where is this bridge? The answer is in the full postcard caption, Rock Island Arsenal, where the bridge still stands near the center of Arsenal Island, just north of the row of the historic stone buildings on Rodman Avenue, the main east-west thoroughfare on the island,. There is another strange feature in the postcard picture – there doesn’t appear to be any water beneath the bridge. Today we can see that this bridge is truly a bridge over nothing that goes nowhere. The golf course surrounds it, with sand traps the only ‘shore’ in sight. You can walk beside or even under the bridge without getting your feet wet. But that wasn’t always the case. An 1876 map that reflects Col. Thomas Rodman’s grand plans for an armory and arsenal depicts a long narrow lake here that reaches from west of Gillespie Avenue (the street that goes past the golf club and Quarters One) several hundred feet to the east. The nearby area is marked “low ground,” probably because it retained snowmelt and rain for a few days. Today we plan such areas as rain gardens or very temporary water storage areas. Another map from the late 1800s shows the ten completed stone shop buildings on Rodman Avenue as well as officers’ residences near the north side of the island. In this map, a smaller lake appears, bisected by this bridge. The body of water is simply called “artificial lake,” and it has no apparent inlet or outlet. Perhaps water was pumped into this low lying land from the river until the soil became so saturated that the little lake was formed. This lake created a strong separation between officers’ homes and the dirtier manufacturing operations, while the picturesque bridge provided a shortcut between home and work. But with no stream filling and freshening the lake; the water would quickly become stagnant and a breeding place for mosquitoes. The postcard would indicate that the lake has been nonexistent since at least the early 1900s, and perhaps well before that. Yet the now unnecessary bridge that was built in 1881 is still an object of fascination and appreciation for its graceful engineering. It is 78 feet long, but buttressed earthen ramps with stone walls extend its effective length to nearly 300 feet. The postcard shows the pair of 25-foot wide arches at the center of the bridge. At either end of the wide arch pair are narrower, human-sized, arches. The lower structure of the bridge is made of precisely cut stones on the exposed exterior, with bricks filling the arches underneath. Above the larger limestone blocks, smaller ‘rubble’ stones form the wide barrier at the edge of the 19 ½ foot roadbed. Barely distinguishable between the arches on the postcard are three carved stone lion heads that function as drains for the road bed. Both are a significant part of the National Historic Landmark that is Arsenal Island. We can only hope that future budgets will permit stabilizing this bridge and even restoring it. This article, by Diane Oestreich, is slightly modified from the original, which appeared in the Rock Island Argus and Moline Dispatch on November 4, 2007.